“I have been concentrating so much on my foundation lately and I would keep that going because a lot of people out there need us and I have realised that the government cannot do it alone, neither can I nor other foundations. I would be concentrating on helping the underprivileged and help them get back to the society which made me who I am today. I have plans to go back to the movie industry. I will be on set very soon with great artistes and I cannot wait to do that. I will not feature in movies as I used to; instead I could be in a few movies per year. I will produce my movies as well as work with other people who have good scripts. “I focused on women and children. Being a mother has made me very passionate about my own child. I would not treat any child less than I would treat my own child. Watching my child grow, go to school and do everything that he does makes my heart ache to see that some people cannot afford the basic things of life that they require and that is why I decided to focus on children. My son gave me a new religion to worship and take care of children”. 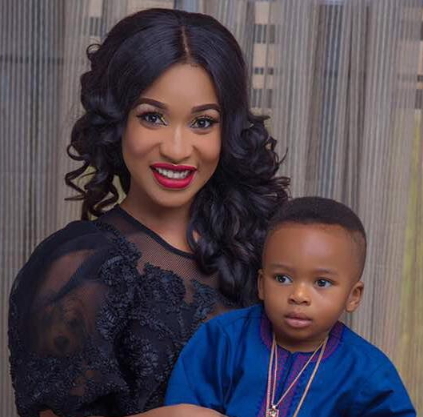 Tonto Tonto,the lovely son will now be her trophy son that we will be seeing 3 times for ten naira because she wants to use him to torture her husband. Yoruba people–trust them– will not fight too much for the boy;afterall it is on record that the father made several attempts to have access to him and he pays monthly dues.Chikena! Miss Tonto, consider your immediate past husband’s advice. Go back to Nollywood and apologize to all the people you offended. Learn to be humble and get to work. Remember, Churchill your sponsor has walked away forever. Except you want to be living on King’s up keep monies. How can she be focusing on movie when some of these their fraudulent NGO’s are paying more. Those corrupt politicians whom you people are servicing,thereby making you feel untouchable are always channeling funds through that NGO. If you are normal,how can you be looking at this your son who so much look like his father and still be vomiting nonsense about your former KING KONG.